Community Volunteering - Global offers students the opportunity to participate in an international volunteering program. Students contribute directly to local communities by bringing their skills, creativity and initiative to projects run by local organisations. 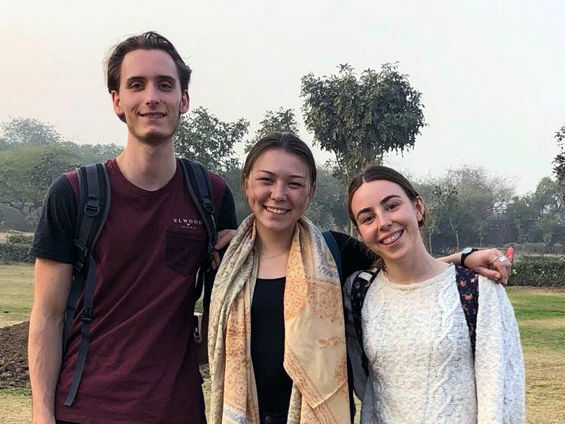 "Over five weeks in January and February, Hannah Veljanovska, Ryan Mati, and myself were placed at Jamghat, an Indian NGO. Jamghat rehabilitates street children through running two shelter homes and a day-care centre. The shelter homes, Aman Home for boys and Anchal Home for girls, provides 24-hour care to the children through providing them access to free education and health care services. The placement was an incredible experience, giving us the chance to work at the organisation and at the shelter homes. During the placement, we engaged with the local staff and were able to develop an in-depth understanding of the organisation and realise the importance of a community-based approach in helping street children. As Jamghat runs smaller shelter homes that cater for up to 13 children, they are able to focus on each child individually. This child-centred approach enabled the children’s developmental needs to be met and created a space where the children feel part of a supportive family. It was only through direct interactions that I could understand how widespread street children are in India. Through volunteering at Jamghat and getting to know the children living at their homes, I was able to grasp the issues that they had faced, such as lack of access to education, and poor nutrition and health. These children were all extremely open and friendly, and engaging with them exposed us to a completely different reality, making it an amazing experience getting to know them all. We spent the majority of our time working on creating content for Jamghat's social media, through the creation of video profiles of the boys, as a means to raise awareness and publicity. We came to understand that the organisation's funding was intermittent; hence, we started a crowdfunding campaign to raise money for them, specifically to cover the costs of running the shelter homes and day-care centre for the next 3 months, giving Jamghat staff more time to locate more long-term sources of funding. This placement was also incredible in fostering my personal development. Living in a foreign country alongside seven other students who were part of the subject gave me the opportunity to interact with individuals with different opinions and perspectives of the world. I developed great friendships from this experience and will treasure the many amazing memories." Find out more about Internships though our Work Integrated Learning program.